Not entirely in agreement with you there, Sam me owd mate. 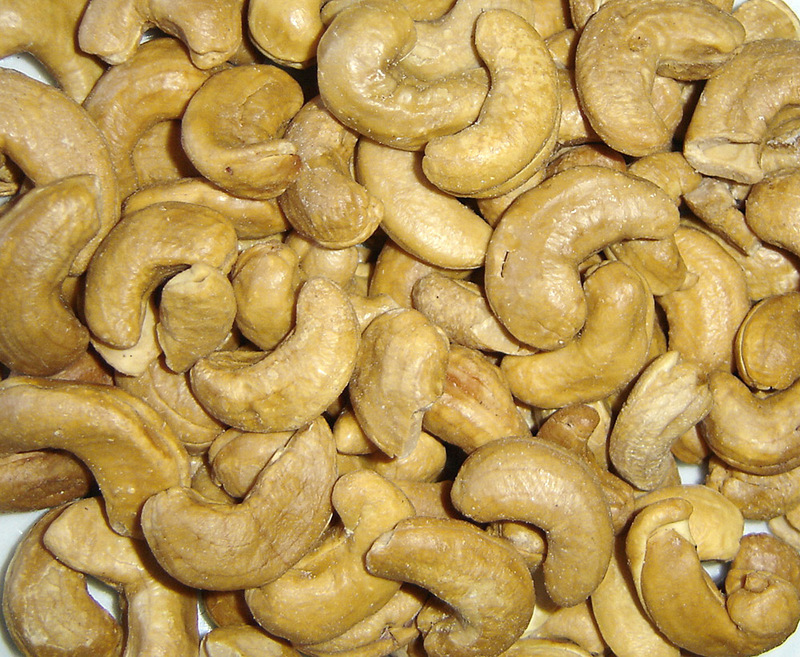 Actually, I firmly believe that alarm bells should start ringing about one’s Joie de vivre when a person starts to go off cashews. 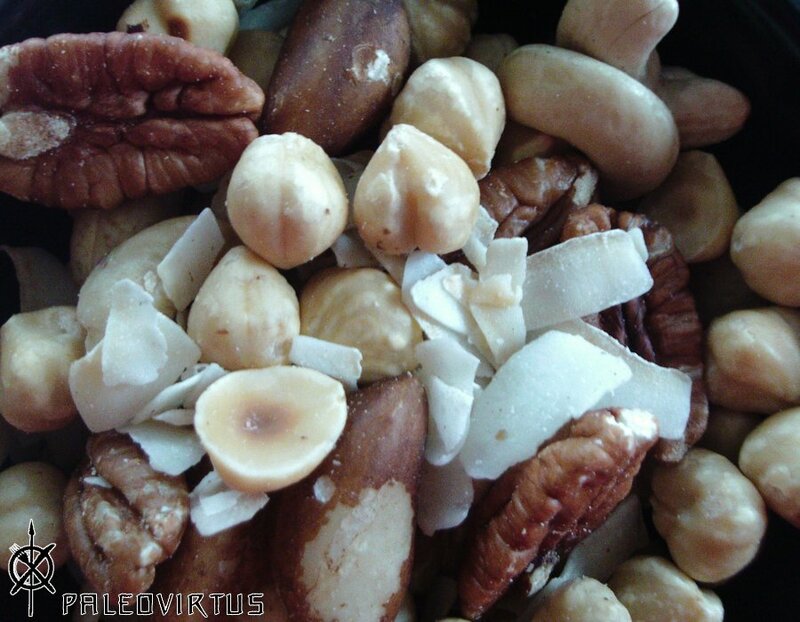 This entry was posted in Food Diary, Recipes and tagged appetizer, chaat masala, nuts, paleo, recipe, roasted cashews, snacks on March 5, 2015 by paleovirtus. Sometimes inspiration arrives via the most tortuous of routes. I’d been indecisive about what to cook for dinner the whole day. I’d tried all the usual tricks to un-block the idea jam – going for a walk, drinking a nice pot of Pu-Erh, chasing the cat, gazing out to sea, plane spotting, being chased by the cat – but nothing could start the old creative juices pumping. This entry was posted in Food Diary, Recipes and tagged apricots, bacon, chicken, Coconut cream, nuts, paleo, pistachios, recipe, smoked Spanish paprika on March 4, 2015 by paleovirtus. I’ve just spent a frustrating couple of hours persuading a bathroom door and a bathroom door handle and lock that seemed from the outset doomed to hate each other until the end of time that they were in fact destined to live happily ever after. Negotiations were not proceeding well, so I was forced to play my trump cards – a large hammer and an enormous drill. A prolonged work session in a small, hot, cramped space does tend to take it out of you. I was in need of a quick, nutritious snack. 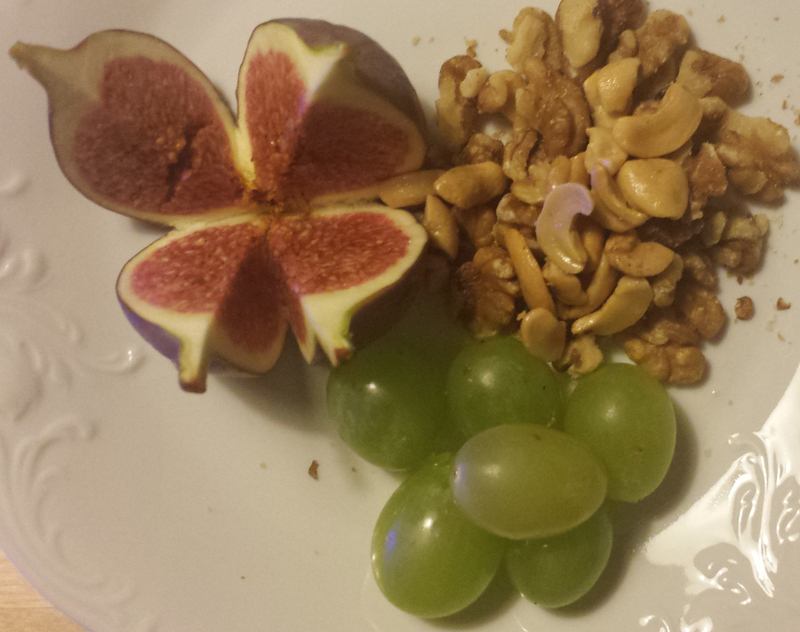 Enter stage left – A fig, accompanied by a handful of walnuts and cashew nuts, and a few handsome grapes. That should keep the furnace well stoked until breakfast time, and no mistake. Needs a cup of tea, though. Positively screaming out for one, truth be told. Tea, Earl Grey, hot. Don’t mind if I do, Captain. This entry was posted in Food Diary and tagged cashews, figs, fruit, grapes, nuts, paleo, snack, walnuts on September 13, 2014 by paleovirtus. We love salmon in this family. Well, no we don’t, actually. We adore salmon in this family. There. I said it. I feel better. My personal favourite method of preparing salmon is by steaming it in my old, somewhat battered, but still functional and supremely reliable bamboo steamer. Thinking about it, it’s that old I’m not entirely sure where I bought it. It might have been in Brussels, sometime in the late 1990s, or then again it might have been here in Malmö, in the early Noughties. One thing’s for sure, it cost next-to-nothing, and continues to give sterling service to this very day. It also smells rather nice when it’s doing its thing, too. Anyroad, I’d been watching a Ken Hom video earlier in the day, and thought I’d prepare that evening’s salmon with a Far-Eastern twist. So, this recipe has some kind of a Sino-Thai influence in the background. It has to be noted, however, that my planning for this meal was somewhat lacklustre, and when it came down to the actual cooking I was running quite late, and not concentrating as well as I should have been. This meant that although the final result was very nice indeed, perfectionist that I am, I think I could have done better. See my notes below for details. 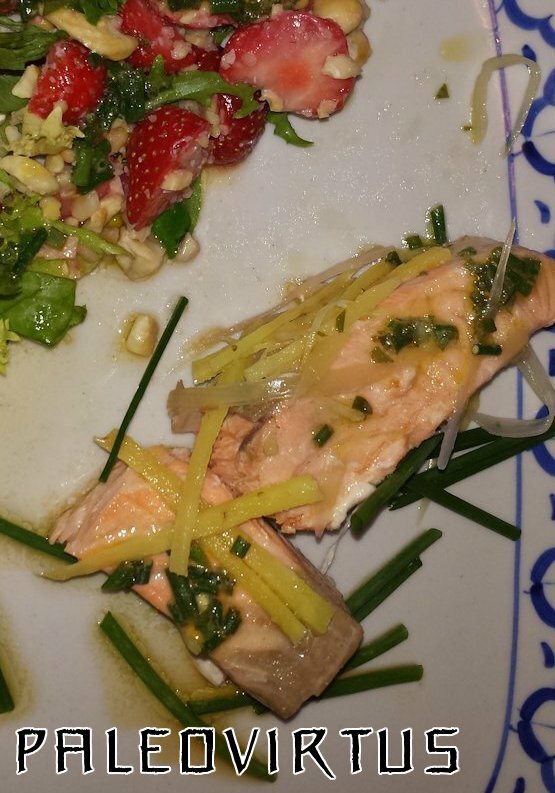 The salad accompanying the salmon was yet another we first saw and instantly lusted after in chef Daniel Green’s book “The Paleo Diet – Food Your Body Is Designed To Eat”. In the book it was also paired with salmon, and we thought that with its sweet-and-nutty flavours it might still work with the salty, somewhat tangy flavours of our salmon dish, and by gum, we weren’t wrong. Make the salad dressing by combining all the ingredients in a small bowl. Set aside. Roughly chop the nuts by placing them in a freezer bag and either whacking them with a rolling pin, or by hacking them with the back of a heavy duty chef’s/kitchen knife. A Chinese cleaver is perfect for this. Place the nuts and the strawberries in a large salad bowl together with the salad leaves. Mix well. Set aside. Line the bottom of your steamer with lemon slices. If using a bamboo steamer, line it with greaseproof paper first, then the lemon slices. Lay the salmon fillets on top of the lemon slices. Scatter the shredded ginger and leeks on top of the salmon fillets. Steam the salmon fillets for about 10 minutes, or until thoroughly cooked. Take care not to overcook them. Every time you overcook a salmon fillet, a sweet’lil puppy-dog catches a nasty cold. When done, remove the salmon from the steamer. Plate up. Place a salmon fillet on each plate. Drizzle over a splash of fish sauce, and a less-is-more splootle of sesame seed oil. Place a generous amount of salad on each plate, and spoon over a little of the dressing. Enjoy. If our local supermarket hadn’t have run out, I probably would have used 3 or 4 spring onions (scallions) instead of leeks, prepared in exactly the same way. If I’d have been more focused, then I would have remembered to have placed a few kaffir lime leaves and bruised fresh lemon grass stalks into the steamer with the salmon fillets. Thai Basil leaves would also have worked well in the salad. Mrs. Paleovirtus opined that the lemon in the dressing overpowered it somewhat, so you might want to play around with the amount used. This entry was posted in Food Diary, Recipes and tagged Asian, nuts, paleo, recipe, salad, steamed salmon, strawberry on September 12, 2014 by paleovirtus.